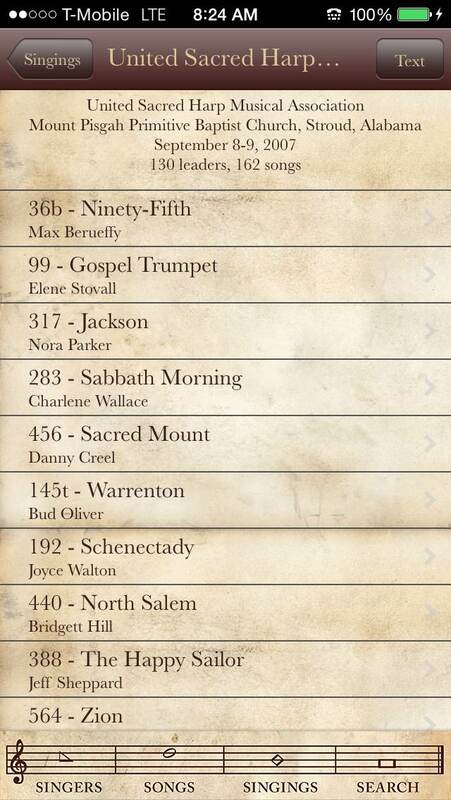 One year ago, Mark Godfrey and Lauren Bock unveiled a new smartphone app made especially for Sacred Harp singers. It’s called “FaSoLa Minutes,” and it is enhancing how we look up song, singer, and singing information. I started using the app as soon as it became available, and have found it enjoyable, easy to use, and frequently helpful. Here are some of the ways “FaSoLa Minutes” can help answer questions about Sacred Harp songs, singings, and singers. Songs: Viewing the top twenty leaders of “Invocation” (p. 492). A Sacred Harp tune catches my attention. I pull out my iPhone, and launch the “FaSoLa Minutes” app. After selecting the song from the app’s “Songs” tab, I can see a list of the twenty people who have led the song the most since 1995, as well as where, when, and how often it has been led each year. I can read the song’s poetry. For most songs there are a few recordings to listen to as well, available from Robert Stoddard’s BostonSing.org website. I can view a bar graph showing how many times the song has been led each year. Something heartening: no matter how popular a song is or isn’t, for most songs in the book, the bars in the graph increase in height in more recent years, a sign that there there have been more and more singings held each year since 1995. Singings: Browsing the minutes of the 2007 United convention. I have the opportunity to go to a singing that’s new to me. Again, I open “FaSoLa Minutes.” Under the “Singings” tab I can peruse the minutes of that singing from the most recent year it was held to as far back as 1995. I can see the order of the tunes led, and who led them. I can see how many leaders and how many songs there were for any given year. 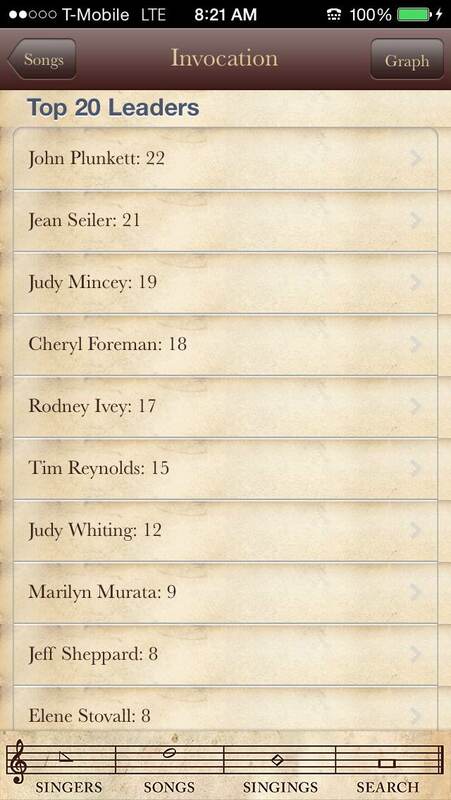 Unlike the annual Minutes of Sacred Harp Singings or the minutes section of the Fasola.org website, the “FaSoLa Minutes” app displays the name of each song led, as well as its leader and page number in The Sacred Harp. Singers: Top songs led by the author. I want to remember if I have led a certain song. I pull out the app again, and look myself up under the “Singers” tab. I can see the chronological list of songs I have led, and where I led them. I can also see a list of the songs I have led beginning with the song I’ve led the most, and continuing on down to the songs I have only led a single time. I can view a bar graph that shows how many singings I have led at each year. I can also see my entropy score, a number that varies based on the range of different songs I have led. And I can access all this information about you too, or any other person who has led at Sacred Harp singings since 1995. I recently spent a week in Alabama, attending a few singings and a session of Camp Fasola. I found that I was not the only one during mealtime conversations who was pulling out the app to discuss songs. We would consult the list of the top twenty leaders of a given song, and lifelong singers would reminisce about those leaders, some now gone. 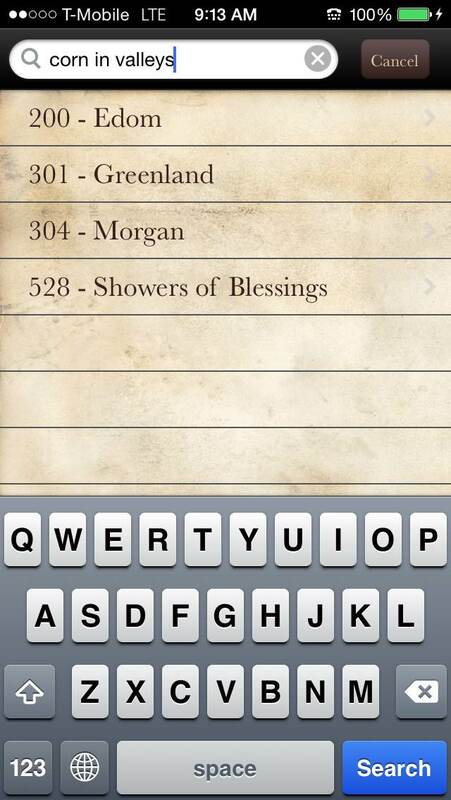 Most Sacred Harp singers who enjoy perusing the Minutes book find they love the accessibility and organization of information about songs, singings, and singers in the “FasoLa Minutes” app. For now, the app is only available for iOS devices, including the iPhone, iPad, and iPod Touch. Created by Mark Godfrey, the app is designed by Lauren Bock. The data used in the app is the information gathered from secretaries by Judy Caudle (and before her by Shelbie Sheppard), and put online by Chris Thorman on the fasola.org website. Additional indexes on the Fasola website, listing songs by their composers, text meters, and more, aren’t accessible through the “FaSoLa Minutes” app. Both the Fasola.org website and the “FaSoLa Minutes” app provide tools for looking up a song if you only remember a few of the words. In the app, you can simply type in a few words from the “Search” tab. “FaSoLa Minutes” was the best $4.99 I ever spent. A small price to pay for an incredible range of functionality, it’s also nice to know that the money received is donated to the Sacred Harp Musical Heritage Association, where it supports the preservation and perpetuation of Sacred Harp singing and its traditions through programs such as Camp Fasola. Clarissa Fetrow lives in Seattle Washington. On February 19, 2011, she walked into the Pacific Northwest Convention – Washington, and has been singing Sacred Harp ever since. This entry was posted in Number, Measure, Weight. Bookmark the permalink. Love the app! When will the 2017 minutes be added? Including a new year’s minutes in the app involves parsing the minutes data after it’s released and some additional work to include audio recordings of select singings. Typically it’s a few weeks after the minutes are published at http://fasola.org that the new year’s data is added to the app, but sometimes it’s a bit sooner.